I love the idea of spooky old houses! 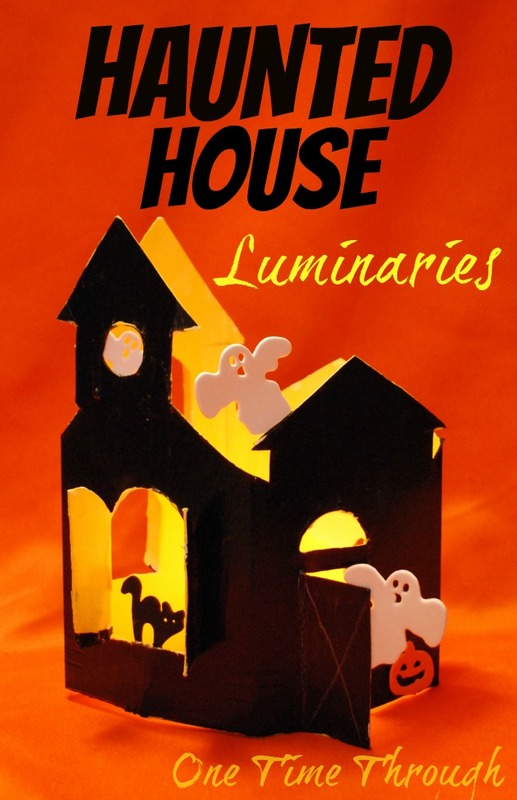 When I was a kid, we had a neighbourhood “haunted house” that we all called “The Moon House.” My friends and I would visit it and sneak inside, past boarded up windows, and explore. Completely reckless… and thrilling! When I think of Halloween, I think of that house – full of ghosts of memories past and creaks and groans. 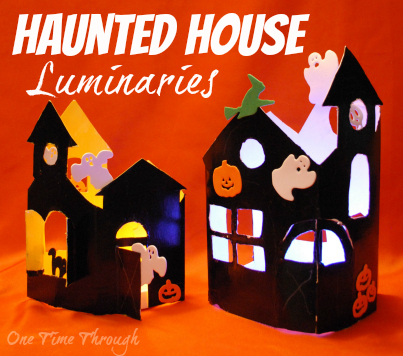 I thought I could create some of that spooky fun with a craft this year with my son, Onetime, and so together, we created this adorable recycled box Haunted House Luminary. 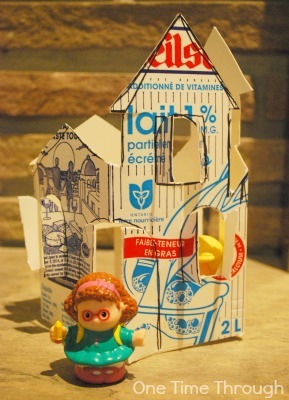 An old box (cereal box, cracker box, granola bar box, milk carton, etc.) – great if it’s tall! To start, clean and dry the box, then completely cut off the tops and bottoms of the box while it’s sitting vertically. You could technically keep the bottom, but removing it, makes it easier for kids to cut the rest of the project. 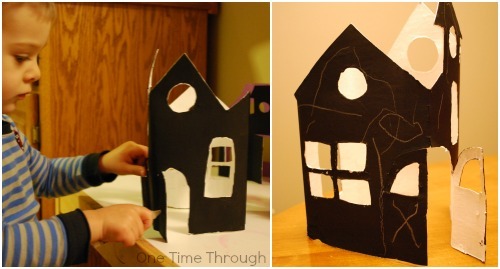 Next, using a black marker, draw the outline of the tops of a house on all sides of the box. 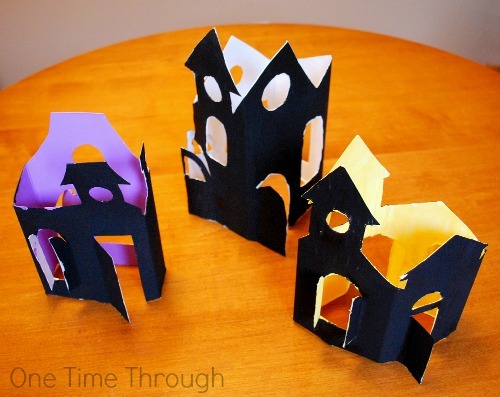 We made a few houses – and tried pointed roofs, flattened roofs, chimneys, and towers. We also drew on where doors were going to be and windows. I did most of the roofline (with Onetime’s input), but he decided where all the windows and doors were going to be and what shape they were going to be. My son wanted windows with shudders (I think he got the idea from the art I did a couple of weeks ago for our Spooky Sounds Experiment post.) I helped him draw and showed him where to cut to make those fun windows that can open and close. After the houses were all cut out (we made a bunch! ), my son had fun playing with them with his Little People! Cute! My husband told me he actually took them outside to play with too this afternoon when I was out. To decorate the houses, we painted them with black acrylic paint on the outside and yellow/purple/white on the inside. To make ours shiny (and more durable), once the paint was dry, I added an extra coat of Mod Podge. 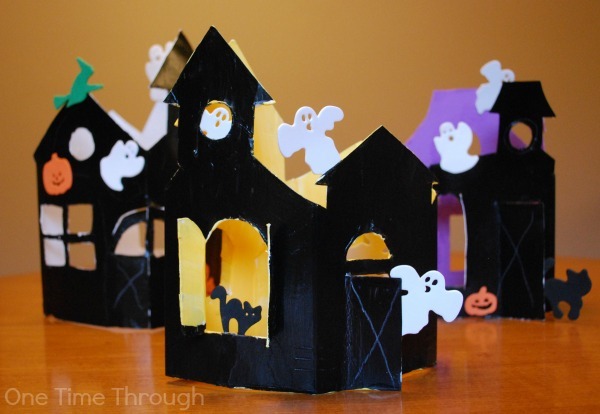 Last, we had a lot of fun gluing on Halloween themed shapes such as ghosts, pumpkins and black cats! Onetime really adores his little luminaries. He was so excited to put the LED candles in and see the light glowing through the windows. His house that was painted white inside looked super cool with an LED that changed colours because each time the light changed, the house took on a totally different feel too! I have to say, I enjoyed making these so much, I did a few of my own too – just for fun! We plan on putting them in the front window for Halloween! 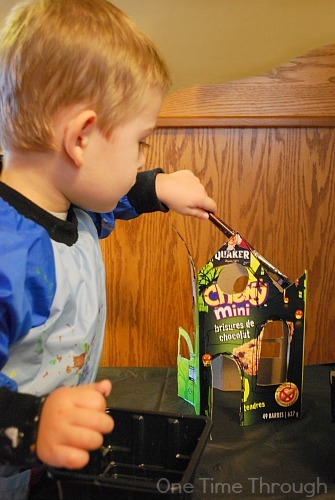 If you’re looking for other spooky Halloween ideas for kids, check out our Halloween Fun Pinterest board!Follow One Time Through’s board Halloween Fun on Pinterest.